It is not just a nursery rhyme…it is a Good Friday treat! 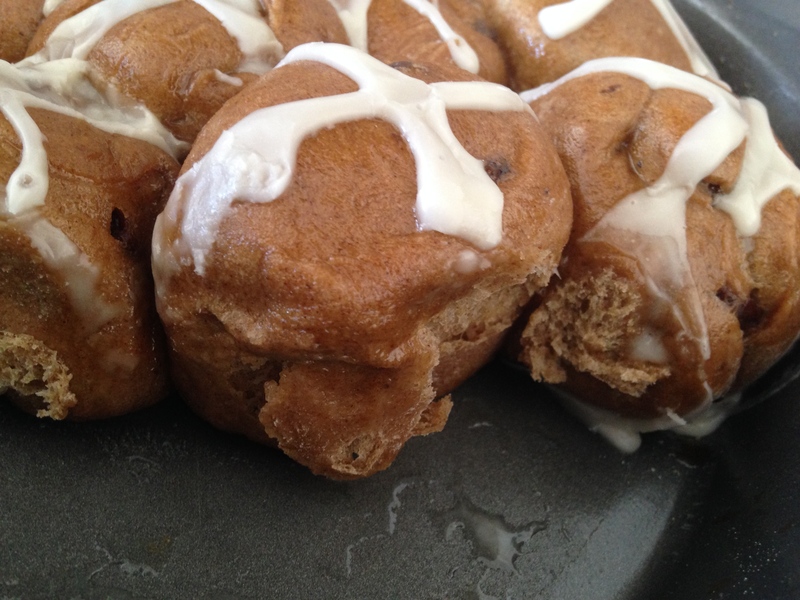 These Hot Cross Buns are warm, fluffy, sweet and spicy! The funny thing is that neither I nor my husband have ever had a Hot Cross Bun so we don’t actually know what they are supposed to taste like. We agree that these are delicious so I must have done something right! 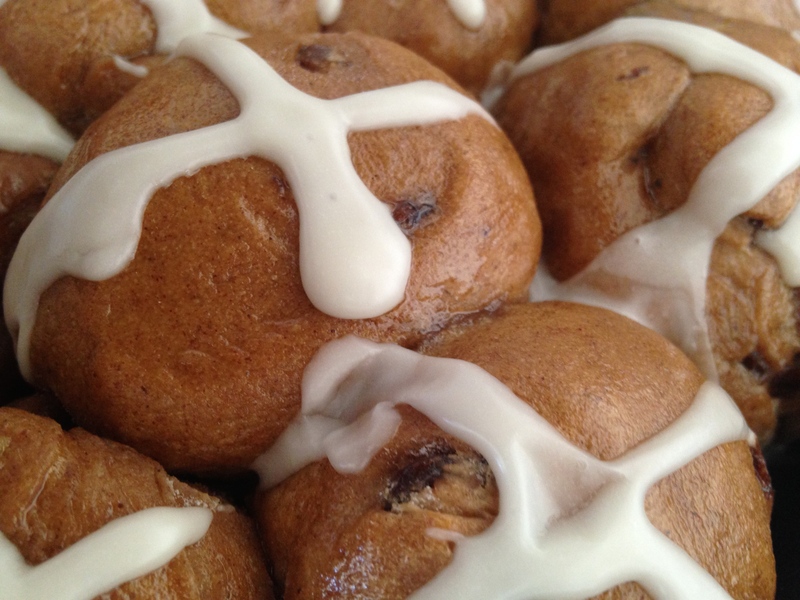 Note: I decided to serve these warm which meant piping the icing crosses while the buns were still warm. Plus, my 4 1/2 year old son was the official cross maker so they have an ooey-gooey look to them which I think adds to the deliciousness! Dissolve yeast in 1/4 cup warm water. Let stand 10 minutes. It should bubble and foam. Sift the flour, cinnamon, nutmeg, zest and salt into the bowl of the stand mixture and mix together. Whisk the oil, maple syrup and 3/4 cup warm water together. Pour the yeast mixture and the maple syrup mixture into the flour. Add the raisins and mix with the paddle attachment of the stand mixer. When combined, switch to the dough hook and knead the dough for about 5 minutes until the dough is smooth and elastic. Add extra flour, a tablespoon at a time, if the dough seems too wet. It should still be sticky. Place dough in oiled bowl and cover with plastic wrap. Let rise about one hour or until it’s doubled in size. Deflate the dough by punching it down (fun!) and then divide into quarters. Then divide each quarter into 3 to 4 buns, trying to get the buns about the same size. Toss a little flour on a clean surface and roll the dough into balls. Place them into a round metal pie pan, starting at the periphery and working your way into the middle. Preheat oven to 375. Cover and let the buns rise again for 15 minutes. While buns are baking, make the glaze by bringing the water and sugar to a bubble over medium heat. When buns come out of the oven, brush with glaze. Then brush with the glaze again. Make the icing. Sift the powdered sugar into a bowl and whisk in the lemon juice or water. Use two teaspoons but add more if it’s too thick for piping. Drop the glaze into a piping bag (or a plastic baggie and cut a hole in the corner). After the buns have sat for 5 to 10 minutes and pipe a cross over each bun. Happy Easter everyone and enjoy these buns hot!